My master bathroom is small. It isn’t just small by today’s modern construction standards (hello bathrooms that are as big as my bedroom); it is small by the 1920s “We should carve out some space from this house for some indoor plumbing” standards. Having a small bathroom means I need it to be organized. I made a resolution this year to majorly declutter my house and I have been through my bathroom. 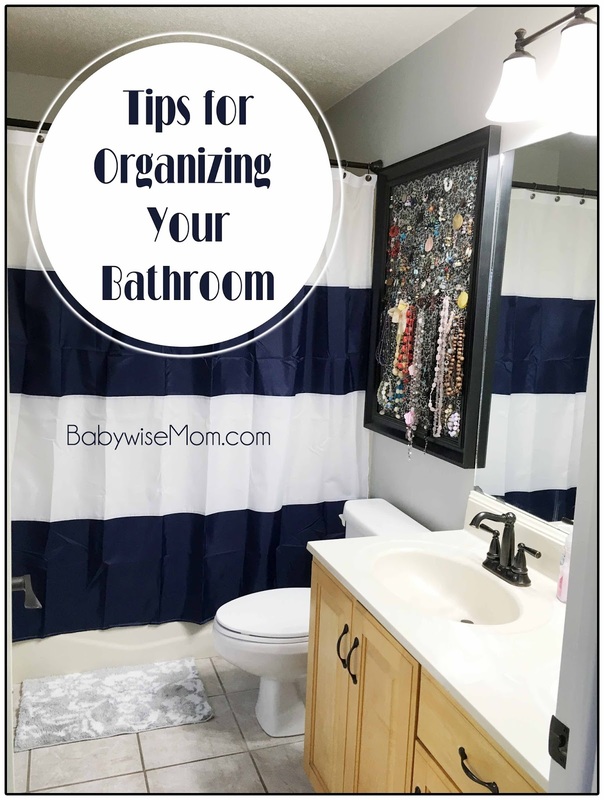 Here are some tips for getting your bathroom organized. This post contains affiliate links. This does not increase your cost. I say it every time that I talk about organizing. I say it every time because it is the number one and best way to make sure things get organized and that you only keep what is necessary. If you love the way things are arranged now and worry you won’t remember how to get them back in the same spots, take a picture of it before you begin. However, I will say that I find when I am putting stuff back, I always have a slight tweak to how it was before so that it is better than it was. So don’t be afraid to approach your current setup differently. When I am removing things, I work on one section at a time. I don’t remove everything from the entire bathroom. I will remove everything from one shelf or from one drawer. I do this so the project remains manageable. I have kids. I am likely to get interrupted a few times during the process. I don’t want stuff scattered everywhere for hours or even into the next day. I work on one small section at a time so I can get it put back together. The bathroom is just a dirty place. It gets dusty. It gets hair all over the place–even when you clean regularly. Hairspray and other hair products get sprayed in there. We painted a few rooms over Christmas break, including our master bathroom. Before we painted, we cleaned the walls and base moldings well. The rooms were quick and easy. The bathroom was the smallest of the rooms (by far) and took the longest to prep (by far). You need to clean each shelf or each drawer well once it is empty. When my mom was my age, I was a young teenager. I remember looking through her make-up and perfumes and being horrified to know she had stuff that had been around as long as I had!!! It seemed like an eternity to me an I couldn’t imagine having things that long. The same can be applied to lotions, perfumes, hair products…try the items and smell them. Ditch them if they feel, look, or smell funky. Throw away old medicine that is expired. They have expiration dates on them. You don’t want your shelves or drawers overflowing. Keep what you use and what you need. I talk about this often, too. Drawer organizers! 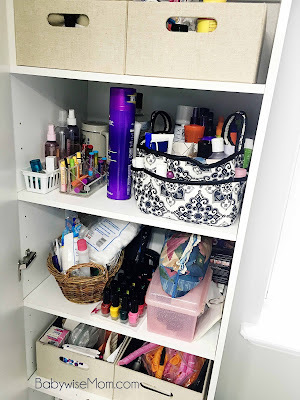 I use these drawer organizers in our bathroom and I LOVE them. I can take them out and wash them in the dishwasher every so often to keep them clean. They help keep the brushes out of your toothbrushes (we keep ours in drawers because I once read that germs from flushing the toilet go in the air and can land on toothbrushes if they are on the counter. For the same reason, we close the lid to the toilet before flushing). It keeps the hair elastics, finger nail clippers, bobby pins, etc. together. Our master bathroom has minimal storage built into it. It has a single vanity with one drawer, one cupboard under that drawer, and the space under the sink. A couple of years ago, we headed to Lowe’s and got an upright cabinet for the bathroom. It is a similar idea to this Pantry Cabinet. I could sing the praises of this thing all day long! It is fantastic. amazon has a wide selection of sizes and styles if you just look here: Storage Cabinets . If you order online, just read dimensions carefully and measure that out at home so you are sure you are getting the size you want to get. I also use a basket for storing nail stuff in. I also have my Storage Caddy that I used when Brinley was a baby as a breastfeeding supply storage solution and now use to hold my hair products and facial cleansing products. 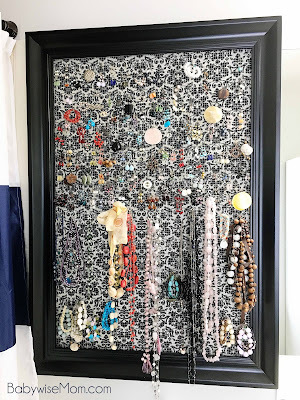 If you are looking for ways to store things, you can “Pinterest with purpose” and search for specific storage solutions. 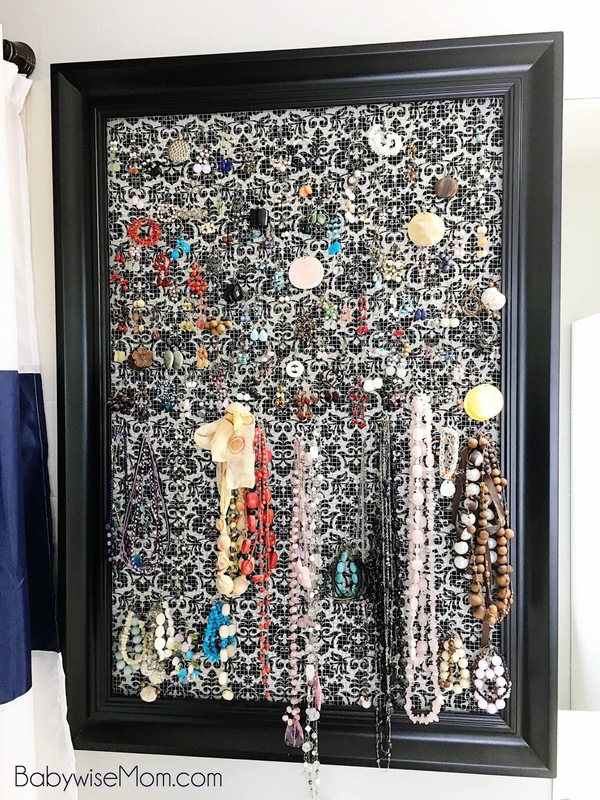 I have this cute jewelry holder my husband made for me hanging in by bathroom. It is very handy! I love being able to see it all at once. Side note, since I am talking bathrooms. I recently purchased some bath towels at SAMs Club. They are fantastic. Hands down, they are the best towels I have owned. You can buy them on Amazon (100% Cotton Luxury Bath Towel), but they are cheaper at SAMs. Another side note, Daylight LED Light Bulbs are amazing. They really do look like daylight. We put these in our bedroom and bathroom at the end of December and I will be buying them for all lights in the house as we need to change them out. It has been so nice during this winter–we have had a few weeks with only a couple of days with a little sunshine. The light bulbs have kept me on the right side of sane.